Fru-Gal.org: My $9.09 Money Maker @ Rite Aid! Plus, Hot Deal on Revlon Beauty Tools! My $9.09 Money Maker @ Rite Aid! Plus, Hot Deal on Revlon Beauty Tools! Rite Aid has a smokin' money maker deal on Revlon beauty tools this week! Buy any two Revlon beauty tools, on sale @ 40% off, and get $4 in UPRs! With the 40% discount, you can get several tools for less than $2 each, making them free with overage after your UPRs. There is a limit of 4 for the amount of times you can do this deal, producing up to $16 in UPRs. I also bought a pack of Pampers, on sale for $9.99. 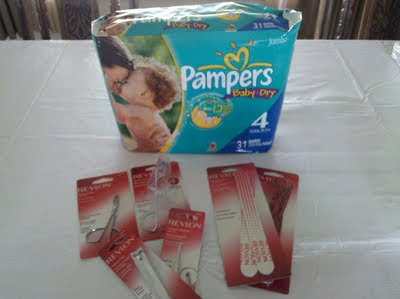 I got back $2 in UPRs and used a $1.50/1 Q from a Cheerios cereal box to get the diapers for $5.49 (other Qs available: 1.50/1 in 5/1 insert; $1/1 Pampers Diapers in P&G Everyday Savings Book; $2.50/1 in 5/1 regional inserts). Using a $3/$15 store survey Q, plus (2) $1 off Rite Aid Video Values Qs, I ended up spending $5.91 OOP and getting back $14.00 in UPRs, making this total transaction a $9.09 money maker!